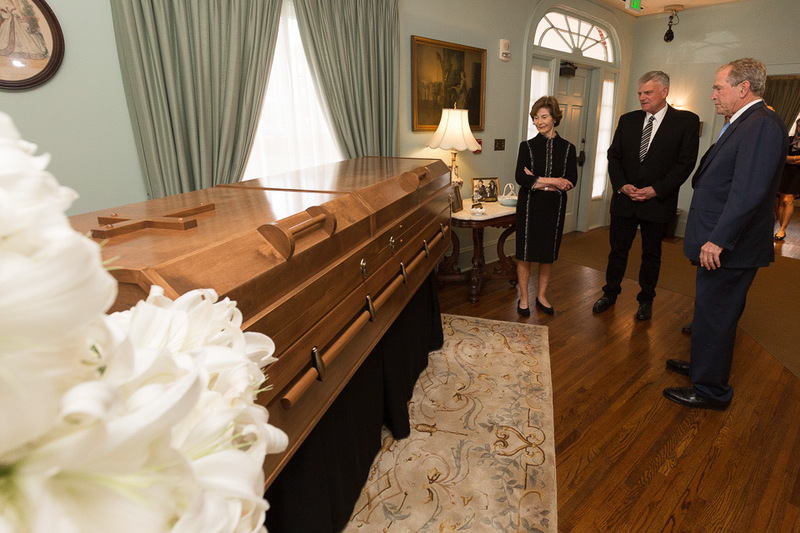 Former first lady Laura Bush and former President George W. Bush stood at Billy Graham's casket with his son, Franklin, on Monday afternoon. The 43rd president of the United States visited the grounds of the Billy Graham Library in Charlotte, North Carolina, on Monday to pay his respects to a dear friend, Billy Graham. Former President George W. Bush and former first lady Laura Bush arrived at about 3:45 p.m. and warmly greeted Franklin and Jane Graham. The two couples then spent about 30 minutes inside the Graham Family Homeplace, where Mr. Graham is lying in repose until Tuesday night. >> The public is invited to the lie in repose period. You can also watch portions of this time live online. Get details. The Graham Family Homeplace—the home Mr. Graham grew up in—is now situated just in front of the Library, an “ongoing Crusade” that presents the message Mr. Graham preached for decades. Franklin Graham told the media that he truly appreciated the Bushes coming to pay their respects to his father. “We’re very grateful that President Bush came today with Laura. That was a great honor,” he said. 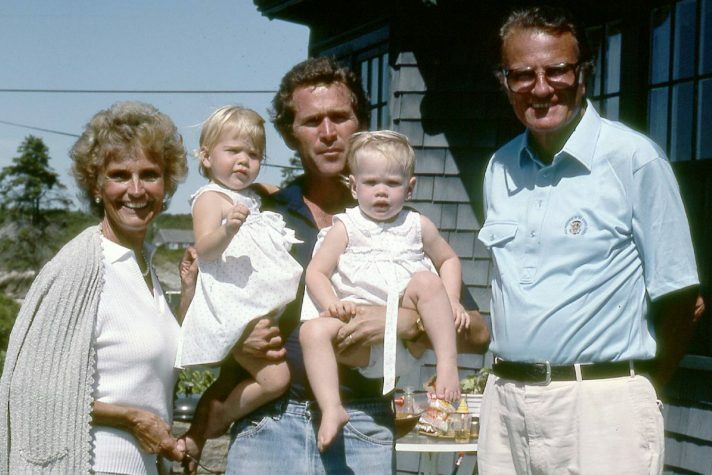 The Bush family has had a relationship with the Grahams for decades. President Bush first met Mr. Graham on his grandmother’s porch in Maine in 1985, 16 years before he took office. Mr. Graham met with every president since Harry Truman, including President Bush’s father, George H.W. Bush. Each president faced challenges during his term, but it was only nine months into the younger Bush’s presidency that the Twin Towers fell and America was changed. President Bush asked Mr. Graham to lead a service at the Washington National Cathedral in Washington, D.C., on Sept. 14, 2001. “As only Billy Graham could, he helped us feel God’s arms wrapped around our mourning country,” he wrote in the Wall Street Journal. 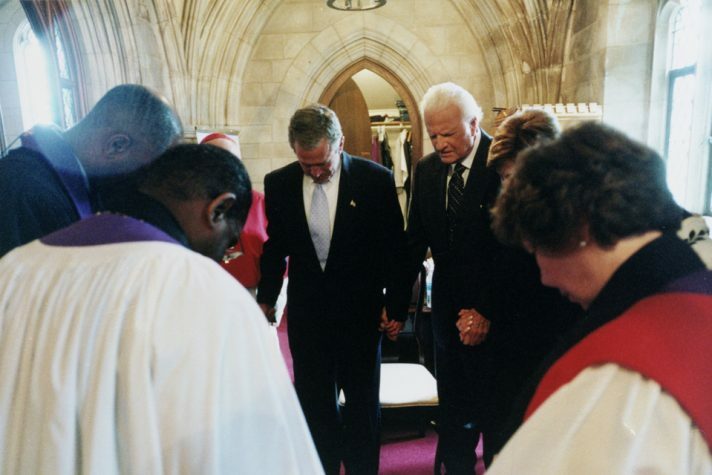 Billy Graham prayed with President George W. Bush and others at the Washington National Cathedral on Sept. 14, 2001, just three days after devastating terror attacks on American soil. “When I was president, I was thankful that Billy came to the White House to visit. He has no political agenda. He has an agenda of the Lord,” he once said. Monday’s visit wasn’t the first time President Bush has visited the Billy Graham Library. He and first lady Laura Bush were there in 2010 to sign copies of their memoirs and meet again with their longtime friend. When President Bush returned to the Library on Monday, this time it was to bid farewell not only to a man he called a friend, but more importantly, a man who showed him the importance of Jesus in his life. Leave your own memories and condolences on Billy Graham’s memorial page. 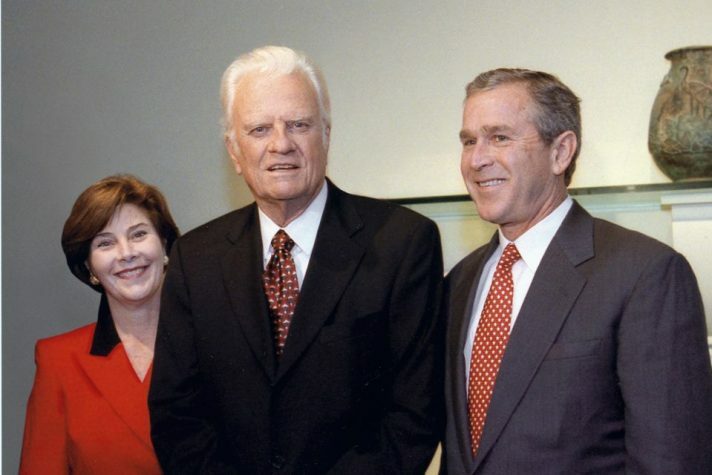 Former President and first lady George W. and Laura Bush with Billy Graham.